In Music We Trust - Vinyl: EP (BTB Ehf. 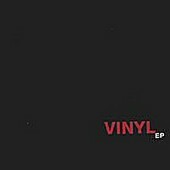 Infusing hard rock, goth, and new wave into a quirky indie-rock setting, Vinyl's EP is a semi-interesting affair. The vocals are passionate, the band knows how to rock, and the music has its hooks. Though, on this four song EP the songs seem to run together, which is always a drag when you're talking fourteen minutes and four tracks. Usually, if a band can't keep your attention in that time, they're just not doing it right. I'll give this a C-.